Your furnace is responsible for keeping your home warm during the cold winter months in and around Columbus. The last thing you want to do is wait for a blizzard to realize that your furnace is in need of replacement. Is your old Columbus furnace costing you thousands on higher than usual electric bills? Call (614) 388-9241 and find out about our affordable and professional furnace replacement and installation solutions today! 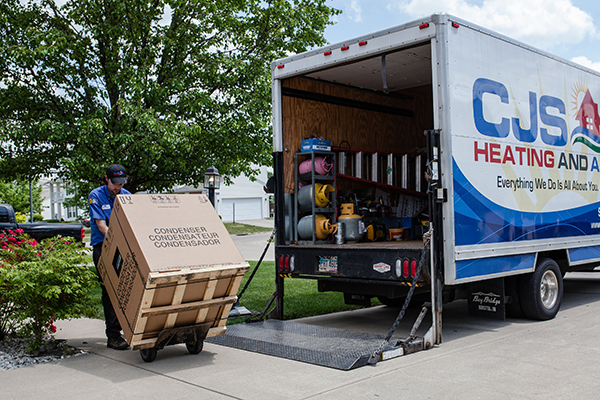 CJS Heating and Air is the HVAC installation company to rely on in all of Columbus. If you’re looking for “furnace installation near me”, give us a call. At CJS Heating & Air, we help our customers with all their furnace installation and replacement needs. From determining whether or not the system needs to be replaced, to finding a new furnace, our staff has the skills needed to get the job done in a timely and professional manner. Additionally, we offer our 100% money back guarantee that will ensure that you are always satisfied with the furnace services we provide you with. Our furnace replacement cost will always beat the rest of our competition! How long does a furnace typically last? A furnace, on average, should last roughly 10 years. In areas such as Columbus, where furnaces see heavy use in the winter, that life may be cut down even further. This is especially true for homeowners who fail to perform the needed maintenance on a regular basis. If your furnace is older than 10 years, and you notice that it is no longer operating as it used to, chances are it’s time for a replacement. At CJS Heating & Air, we help customers in and around Dayton with all their furnace replacement and installation needs. From finding the right furnace, to installing it according to factory standards, our staff has the skills needed to get the job done. What are other signs that your unit needs to be replaced? Strange Noises – During normal operation your furnace should make some amount of noise. With that being said, grinding, squeaking, clanking, and other strange noises should be looked into. A unit with mechanical failures may be too far gone to repair at all. Energy Efficiency – The furnace is one of the largest consumers of energy in your home. As it ages, this energy inefficiency can only get worse. This can cost you significant amounts of money during the winter seasons where the furnace sees the most use. Fluctuating Operation – Does your furnace turn on and off without ever heating your home? Do you notice that the air is hot sometimes and cool others? Fluctuating operation is a clear sign that your furnace is on its last legs. This can be attributed to both mechanical or electrical failures. Once your home furnace has reached the end of its life, our clean, screened, trained and timely techs will be there to help. With our expert furnace installation solutions CJS can quickly remove your old furnace, and have a brand new one installed in its place, thus reducing your new furnace cost. We have factory trained technicians with the skills needed to install a furnace according to exact factory specifications. This will provide you with the peace of mind you deserve. At CJS Heating & Air, our goal is to guarantee the comfort of all our customers in and around Columbus. That is why we offer the highest quality furnace installation and replacement solutions in town. First off, we can help you determine whether or not your furnace needs to be replaced. If you find that it does have to be replaced, we can also help you find a furnace that will work efficiently when cooling your home. Additionally, with our factory training, we guarantee that the services we perform in your home, will be inline with the manufacturer requirements. This will help to keep your furnace under warranty and ensure that the system will work perfectly. We also offer our 100% satisfaction guarantees that will provide you with peace of mind knowing that we will be there to help if something goes wrong. When you need quality furnace installation and replacement solutions from professionals who actually care about your home, remember that CJS means YES! Call (614) 388-9241 and schedule an appointment for your home needs today!